We awake in Levanto to our last day in Italy and the end of an excellent holiday. I packed the bicycle and donated my CO2 canister to the local bike as it couldn’t go in the plane. We did our last shopping walk and bought final presents. Levanto appears to have had its holiday accommodation building boom in early 80s. Parking is scarce, and we were pleased to have underground parking in the Oasis Hotel. Departing Levanto the coastal drive to the Rome airport was predicted by Maps.me to be 430km & 4:40. We exited the AutoStrada to the coast via the old port town of Livorno. It was a large working port with cruise ships and large inter-island ferries. The ancient castles and walled town had been heavily bombed in WW2, with some had been restored. We enjoyed our last panini lunch at a cafe on town square. The town had a designer shop area aimed at the cruise ship customers. Due to a multi-car accident at a section of roadwork, we consumed our spare time contingency and dropped the SIXT rental car back with 15mins to spare at 18:45. We had enough time in the lounge to get some dinner and my only hot chocolate in Italy. Our full plane left on time at 22:00 for 6hrs flight to Abu Dhabi. The last sector home to Sydney was 13:00hr flight. We used the Etihad lounge in Abu Dhabi to relax before 9:00am flight departure. The flight to Sydney for another 14:00hrs and we arrived on time early into Sydney. Simon picked us up and as always we appreciated being home. Livorno- 11th Century Tower incorporated into old town. We fueled up with an early hotel breakfast, then took the short tunneled train ride from Levanto to Monterosso to begin the coastal walk to Vernazza. The day started cool, with the first 4Km track not yet being busy. It was a steep, narrow track with steps cut into the seemingly almost vertical steep slope dropping a long way to the ocean. This section took 2 hrs and the legs felt worked. Vernazza’s tiny harbor was the focal point of the gelato enjoying tourists. There were a lots of interesting shops and bars in the narrow street and was one of the most photographed village on the Cinque Terre. An observation was that the beach size appeared to reduce as we headed south, with Bonassola, Levanto and Monterosso having the longest beaches. The four most southern fishing villages of Vernazza, Corniglia, Manarola and Riomaggiore had tiny or no beaches and/or small boat harbors. We then started the 3.5km from Vernazza to Corniglia. This was slightly easier, although the first climb was steep up seemingly endless stairs. On arrival in Corniglia, it was time to rest the legs and eat lunch. We found a nice touristy outdoor cafe and enjoyed paninis and ‘aqua with gas’. Corniglia appeared to have no easy access beach or harbor on the north side. After lunch, we headed through town and descended many steps to the train station for the 5 min trip to next village of Manarola. We had a quick look around Manarola. It had a steep, main pathed street to the ocean, lined with fishing boats. There was a hoist to get the boats into the water. We then continued by another short train ride to Riomaggiore. This village had a scenic tiny harbor and the multi colored village seemed to hang on the cliffs. Some of the fishing boats were stored on the main path thru the village. This was our last village and we felt it was one one of the prettiest. There was an option to take a ferry back to Levanto (€16). We decided to take the train instead and use the time to look around Levanto. Before packing the bicycle for the flight home, I had to scrub it thoroughly with soap and a tooth brush to remove any remnants of Tuscan white roads. Australian customs are very strict on this. Our last Italian dinner was at a relaxing tourist restaurant La Posada, near the beach. I finished with Bruschetta and Ravioli and we enjoyed the local wine. We had our last breakfast together, and Franco gave us a tour of the private chapel. He was very proud of the villa and the chapel. The Villa was renovated in 1500s and 1800s! We loaded the car and did our last drive down our favoured cycling descent (SP51) to Poggibonsi. We bid farewell to Becky and Charlie at Poggibonsi Station. They caught 11:45 train to Florence then a fast train to Bologna for a few planned days of sightseeing before flying home. The next phase of our Italian holiday started as we drove north west to the Cinque Terre coastal region. On route we visited the walled town of Lucca, located at the north end of Tuscany region. It is a Renaissance era walled town which we enjoyed wandering the narrow streets. Interestingly, Wikipedia told us in 56 BC at the Lucca Conference, Julius Caesar, Pompey, and Crassus reaffirmed their political alliance. Beginning in the 11th Century, Lucca became prosperous through the silk trade and came to rival the silks of Byzantium. The final drive to the Oasi Hotel at the seaside town of Levanto was a mix of tolled Autostradas (€12+€2+€2) and a final very twisty decent. Finding the hotel and it’s parking was easy. It was close to the beach and the underground parking was easy. This town is a popular base and starting point for the train to the Cinque Terre villages, so parking is at a premium. With the remaining daylight, we did a scenic walk from Levanto via the old Maremonti Pedestrian & Bike train tunnel located in an abandoned train tunnel. There were a few cyclists training doing laps. Dinner was tasty seafood at a good cafe. Tomorrow is the big tourist day to see the 5 villages hanging on the seaside cliffs. Old Levanto to Bonassola train tunnel built in 1874, survived Allies bombing in WW2, then replaced by a larger train tunnel. It was converted to bicycle/walking path and opened in 2011. Hotel Palazzo Vannoni, Levanto. Early 17th Century Palace. With an early breakfast, still no WiFi to distract us and wanting to get to the tourist town of San Gimignano for lunch, we headed down the scenic SP51. I topped out at 60km/hr as there was a slight headwind and my jacket is not very aerodynamic- it was a lot of fun to descend from 560m to 120m in about 10km. Karen met us in the car at the bicycle hire store on the other side of Poggibonsi. The four of us set out for 7.5km climb up 220m to San Gimignano. We found the town square, and scouted out a possible lunch location. Most had only paninis, so we enjoyed take-away pizza on the steps of church in sun. Desert was gelato. We started queuing at the “Best Gelato in the World”, and as the queue was long we opted for the “World’s Best Icecream”. It was very tasty and good energy food for the descent back. We were a bit early for Cicliosport opening due to lunch time siesta. We are amazed at how many businesses and schools still practice this break. The bikes were returned with no issues (ebikes @ €145ea and carbon @ €180). We learnt a lot about ebikes over the week, especially about managing assist power and also taking advantage of regeneration braking. Before dinner, we looked around the old town of Castellini, and were amazed by the tunnels built inside the wall. These days they housed wine casks, restaurants and the professional photographer with amazing local Tuscany landscape photos. Dinner was at a restaurant in the church square which had been run by the same family since 1892. Only the English speaking patrons were queuing at 19:30 when the restaurant opened. I ordered buchetta, tortilini with shaved truffle, and tiramisu for desert. All was great, as I love Italian food! Karen arriving after another Tuscan climb. Acting our age in the narrow alley ways. End of Tuscany Cycling Dinner. 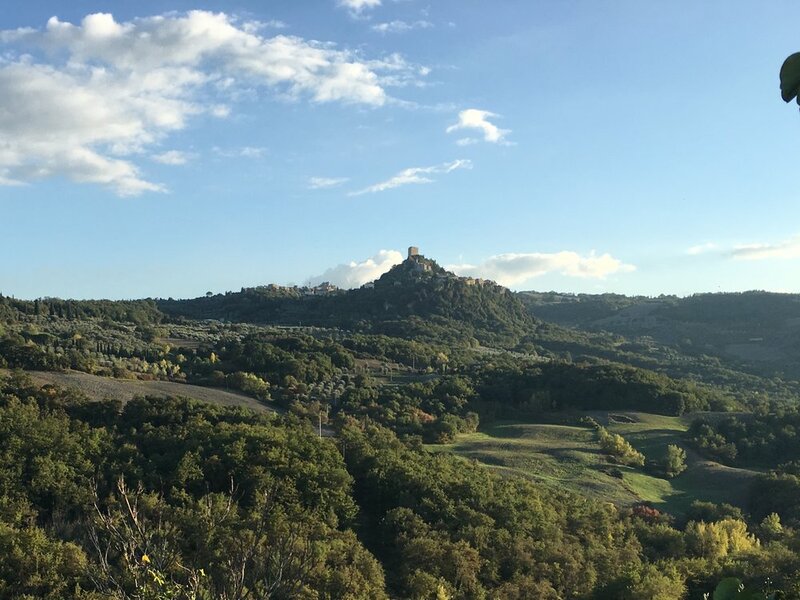 Day 9 - Saturday 2018-10-13 Castellina to Madona di Pietracupa return. Charlie and I started with a reconnaissance ride north towards Greve to see the elevation change. The drop was 340m to our turnaround at 10.5km. It was a fantastic descent (some 15%), and very cold at the river just past Grignano. The climb back was exhausting in places and we soon warmed up. Being the weekend there some other cyclist out and a lot of red Ducati’s. After another big breakfast, the plan was for the four of us to cycle to Madona di Pietracupa. It was another scenic hamlet village. We had a walk around the interesting Saturday markets in Castellina. The descent to our destination was a great twisty, scenic route. We settled on a restaurant with a great view and pastor. The waiter even talked cycling. Dinner was last night leftovers as we watched the moon in the clear night. The days have been 22°c and the evenings down to 8 °c. Charlie and I did an early morning reconnaissance ride north on SR222 to assess the grade. The 350m descent to 220m was fantastic and an exerting climb back. At the bottom of the valley our fingers were very cold. We decided this route was not a good start for the first full day on the ebikes. Over a late, long breakfast we planned some possible routes and then headed to the tourist info to buy a map. We were advised to take the white road via our hotel to Radda. This had a descent from the ridge to the river and via the L’Eroica route to Radda. In the old village of Radda, we enjoyed a good pasta lunch- lots of bread, tomato’s, pasta and olive oil. The ride back was via the bitumen road and was quicker and easier. The ebikes performed well. For dinner, we walked the 2.5km to in the old town of Castellina. The restaurant had great food, though the service not quite comparable. The Rooster is the Chianti Region symbol since 1600s. After a welcome breakfast (I’d missed previous night’s dinner), we checked out and headed off on foot as Siena tourists. We went to the Piazza del Campo. This famous square hosts the crazy horse race twice a year. We climbed the 100m Torres del Mangia up the 400 steps to get a panoramic view over the square and rolling Tuscan hills. We then enjoyed a relaxed one hour drive to the Spa area to the south east of Siena. Bagno Vignoni is a beautiful small village, with a hot spring large rectangular pool dating back to 1660. Although no longer used, it is the centerpiece of the village, surrounded by inviting outdoor restaurants. The afternoon sun was drawing patrons to enjoy the setting. After 370 days and 10,700km cycling, the journey to compete in my second L’Eroica in Gaiole Vintage bicycle ride began. The scenery into Abu Dhabi after 14.5hrs flight was interesting with the contrast of sparse settlements in deserts. The transfer was 3hrs in a better terminal then I’d heard. With free airport WiFi, I messaged home to hear of the heavy rain in Sydney- maybe the worst drought in 50yrs is breaking. Karen had just flown in from Singapore. The excessively sweet $8 hot chocolate was a reminder that Australia makes the best hot chocolates in the world! At 8:30, I boarded for the final 6hr sector to Rome (2900mls) on a B777-300. This flight also had lots of spare economy seats. The Etihad service was good and the food met expectations for airlines. After 24hrs travel, I arrived at Rome Fiumicino Airport on time at 14:00 and the bike arrived ok. The car hire pickup was a Fiat SUV at Sixt Rentals, and I headed off on 250km drive to Siena. I was advised to go via A4 , north of Rome as it had a higher speed limit then the coastal route. It was an easy drive, especially as the car had Apple Play and displayed my Google Maps. I listened to Italian pop for a while until I reverted to my iPhone playlists. Arrival at Hotel Italia at 18:00 was the end of 29hrs of travel. I found a car spot in the tight hotel carpark and checked in. The room is on the top floor with limited view. After a welcome shower, I headed to the tourist area and sat down to a welcome Italian dinner. Naturally I ordered Bushetta with tomato and mozzarella! Tomorrow I sleep in, assemble the bicycle and drive to Giaole to register and enjoy the vintage bicycle festival. I managed to cycle 200days straight- even in the snow.